The Fly is a 1986 American science-fiction body horror film directed and co-written by David Cronenberg. Produced by Brooksfilms and distributed by 20th Century Fox, the film stars Jeff Goldblum, Geena Davis and John Getz. Loosely based on George Langelaan's 1957 short story of the same name, the film tells of an eccentric scientist who, after one of his experiments goes wrong, slowly turns into a fly-hybrid creature. The score was composed by Howard Shore and the make-up effects were created by Chris Walas, along with makeup artist Stephan Dupuis. The film was released on August 15, 1986 to massive acclaim by critics and audiences, with praise mainly regarding the special effects and Goldblum's performance. It grossed $60.6 million at the box office against its nine-million-dollar budget, becoming the largest commercial success of Cronenberg's career. Walas and Dupuis' work on the film resulted in their winning an Academy Award for Best Makeup, the only film directed by Cronenberg to win an Oscar. A sequel, directed by Walas, was released in 1989. Seth Brundle, a brilliant but eccentric scientist, meets Veronica "Ronnie" Quaife, a science journalist, at a press event. He takes her back to his warehouse home and laboratory and shows her his invention: a set of "telepods" that allows instantaneous teleportation from one pod to another. Seth convinces Ronnie to keep the invention secret in exchange for exclusive rights to the story, and she begins to document his work. Although the telepods can transport inanimate objects, they mutilate live tissue, as is demonstrated when a baboon is turned inside-out during an experiment. Seth and Ronnie reconcile. Seth begins to exhibit increased strength, stamina, and sexual potency, which he believes is a result of the teleportation "purifying" his body. He has sugar cravings and Ronnie is concerned about Seth's deteriorating sanity and also strange, bristly hairs growing from his back. Seth becomes arrogant and violent, insisting that the teleportation process is beneficial, and tries to force Ronnie to undergo teleportation. When she refuses, he abandons her, goes to a bar and partakes in an arm-wrestling match, leaving his opponent with a compound fracture. He meets a woman named Tawny and brings her back to his warehouse, where Ronnie rescues her from teleportation. Seth throws her out, but when his fingernails begin falling off, he realizes something went wrong during his teleportation. He checks his computer's records and discovers that the telepod computer, confused by the presence of two lifeforms in the sending pod, fused him with the fly at the molecular-genetic level. Seth continues to deteriorate, losing body parts and becoming less human in appearance. He reconnects with Ronnie and theorizes that he is becoming a hybrid of human and insect. He has nicknamed this "Brundlefly". He has also begun vomiting digestive enzymes onto his food to dissolve it and has gained the ability to cling to walls and ceilings. He realizes he is losing his human reason and compassion, driven by primitive impulses he cannot control. Seth installs a fusion program into the telepod computer, planning to dilute the fly genes in his body with human DNA. Ronnie learns that she is pregnant by Seth and has a nightmare of giving birth to a giant maggot. She has Stathis persuade a doctor to perform an abortion in the middle of the night. Having overheard their conversation, Seth abducts Ronnie before the abortion can take place and begs her to carry the child to term, since it may be the last remnant of his humanity. Stathis breaks into Seth's lab with a shotgun, but Seth disfigures him with his corrosive vomit. Seth reveals his desperate plan to Ronnie: he will use the telepods to fuse himself and her, together with their unborn child, into one entity. As Seth drags her into one of the telepods, she accidentally rips off his jaw, triggering his final transformation into the insectoid-human Brundlefly creature, which bursts from Seth's decayed human skin. Brundlefly traps Ronnie inside the first telepod and enters the other. The wounded Stathis uses his shotgun to sever the cables connecting Ronnie's telepod to the computer, allowing Ronnie to escape. Breaking out of his own pod just as the fusion process is activated, Brundlefly is gruesomely fused with the metal door and cabling of telepod 2. As the deformed Brundlefly/telepod creature crawls out of the receiving pod, he begs Ronnie to end his suffering with the shotgun, and she tearfully shoots him. In the early 1980s, co-producer Kip Ohman approached screenwriter Charles Edward Pogue with the idea of remaking the classic science fiction horror film The Fly. Pogue began by reading George Langelaan's short story and then watching the original film, which he had never seen. Deciding that this was a project in which he was interested, he talked with producer Stuart Cornfeld about setting up the production, and Cornfeld very quickly agreed. The duo then pitched the idea to executives at 20th Century Fox and received an enthusiastic response, and Pogue was given money to write a first draft screenplay. He initially wrote an outline similar to that of Langelaan's story, but both he and Cornfeld thought that it would be better to rework the material to focus on a gradual metamorphosis instead of an instantaneous monster. However, when executives read the script, they were so unimpressed that they immediately withdrew from the project. After some negotiation, Cornfeld orchestrated a deal whereby Fox would agree to distribute the film if he could set up financing through another source. The new producer was Mel Brooks and the film was to be produced by his company, Brooksfilms. Cornfeld was a frequent collaborator and friend of Brooks, who together also produced David Lynch's film The Elephant Man. Cornfeld gave the script to Brooks, who liked it but felt that a different writer was needed. Pogue was then removed from the project and Cornfeld hired Walon Green for a rewrite, but it was felt that his draft was not a step in the right direction, so Pogue was then brought back to polish the material. At the same time, Brooks and Cornfeld were trying to find a suitable director. Their first choice was David Cronenberg, but he was working on an adaptation of Total Recall for Dino De Laurentiis and was unable to accept. Cornfeld decided on a young British director named Robert Bierman after seeing one of his short films. Bierman was flown to Los Angeles to meet with Pogue, and the film was in the very early stages of preproduction when tragedy struck. Bierman's family had been vacationing in South Africa and his daughter was killed in an accident. Bierman boarded a plane to go to his family, and Brooks and Cornfeld waited for a month before approaching him about resuming work on the picture. Bierman told them that he was unable to start working so soon, and Brooks told him that he would wait three months and contact him again. At the end of the three months, Bierman told him that he could not commit to the project. Brooks told him that he understood and had freed him from his contract. Brooks left his name off the credits so as people would not go to the movie expecting what one would expect from Mel Brooks. Geoff and Barbara Powell are a happily married couple. Geoff, a brilliant scientist, has been working on a teleportation machine, but is unwilling to tell his employer, Phillip DeWitt, or his friend, Harry Chandler, about the nature of the project. DeWitt is greatly displeased by this, and threatens to pull his funding of the mystery project unless he is given full disclosure. After several failed experiments, such as a monkey's atoms never reintegrating after disintegration, Geoff eventually is successful in teleporting both inanimate and living objects. However, when he tries it on himself, a housefly slips into the booth with him. Seemingly normal at first, Geoff soon develops incredible strength, stamina, and energy. After sprouting fly-hairs and losing his fingernails, Geoff eventually discovers that the fly has been absorbed into his body, and that its cells are now taking over his own. As he slowly mutates into a giant fly, Geoff loses body parts, and becomes able to climb walls, as well as digest food with corrosive vomit. Barb is horrified to learn that she is pregnant by Geoff, and cannot be sure if the child was conceived before or after his teleportation. Eventually, Chandler discovers the teleporter's existence, reveals it to DeWitt, and demonstrates it on a cat, only to have the lost monkey atoms return from the ether and create a horrible "monkey-cat" creature, which DeWitt beats to death with a metal rod. Despite this failed experiment, DeWitt sees the substantial monetary value of the device, and so takes possession of the teleporter. Geoff (now mostly transformed into a fly-monster and unable to speak) learns of this, and goes to DeWitt's office building, followed by Barb. Geoff confronts DeWitt, starts a fire in the lab where the teleporter is now housed, and kills DeWitt by vomiting and feeding on him. He then traps himself in one of the teleportation booths just as Barb arrives to watch the fire kill him and destroy the teleporter—his intent all along. In a coma, Barb dreams of giving birth to a giant maggot, only to wake up in a hospital, where it is revealed that she's given birth to a healthy baby boy. The revised script differed greatly from Pogue's screenplay, though it still retained the basic plot and the central concept of a gradual mutation. Cronenberg rewrote the characters and most of the dialogue from scratch (as well as fusing DeWitt and Chandler--who had romantic intentions toward Barb in the Pogue draft--into Stathis Borans), and carried over a few key moments and concepts. Certain aspects of the transformation from Pogue's draft (such as the hero's loss of body parts) were expanded upon, and Cronenberg also layered in his trademark themes of sexuality, body horror, and personal identity. He also made it a point to keep Seth Brundle as articulate as possible for as long as possible, as opposed to Pogue's draft, in which Geoff Powell loses his ability to speak two-thirds of the way through the script. Seth Brundle's increasing mania and personality changes in the early stages of the transformation were emphasized in the rewrites, and the notion of the transformation itself being a horrible (and very metaphorical) disease became a key factor in the new script. Also, in this version, Brundle was clearly transforming into a bizarre hybrid creature as the result of a genetic fusion, whereas in Pogue's version, Powell was being taken over by the fly's cells, which had been absorbed into his body (thus slowly transforming him literally into a giant fly, rather than Brundle's deformed man-fly mixture). Cronenberg's version also retained such moments as Brundle catching a fly in mid-air, the fingernail-pulling, and the maggot-baby dream (which was moved to an earlier point in the story, and used for thematic and plot purposes rather than as an end-of-film shock moment). The "monkey-cat" of Pogue's script was repurposed by Cronenberg into a twisted, desperate attempt by Brundle to find a cure, and Pogue's sequence of a fly leg hatching from Geoff's side was taken one step further, with Brundle amputating the twitching limb with his teeth. Pogue's script also featured a bag lady being murdered by Geoff in an alley, and Cronenberg revised this so that the woman was killed by vomit-drop (as with DeWitt's murder at the end of the original draft) rather than Geoff cutting her throat accidentally (however, Cronenberg never filmed his version of this sequence, which was written out of the final shooting script). While Cronenberg's script did not end with Veronica Quaife giving birth, it did end with a coda which revealed that she was pregnant with a normal baby, conceived by Borans after Brundle's death (and the abortion of Brundle's possibly tainted fetus). Despite the extensive rewrite of Pogue's script, Cronenberg insisted during Writers Guild arbitrations that he and Pogue share screenplay credit, since he felt that his version could not have come to pass without Pogue's script to serve as a foundation. With a script that everyone approved of, Cronenberg assembled his usual crew and began the process of casting the picture, ultimately deciding on Jeff Goldblum and Geena Davis for the leads. Chris Walas, who had designed the creatures in Gremlins, was hired to handle the film's extensive special effects. Filming took place in Toronto in 1985–1986. The producers also commissioned musician Bryan Ferry to record a song for the film for promotional purposes. The resulting track was entitled "Help Me". A music video was made for the song, and footage from the film was prominently featured in it. Cronenberg admitted to liking the song, but felt that it was inappropriate to the film itself. Brooks and Cornfeld originally wanted to play the song over the closing credits, but after Cronenberg screened it for them, they agreed with the director that it did not mesh with the movie. As a result, the song is featured only briefly in the film, in the background during the scene where Brundle challenges Marky in the bar. "Help Me" became rather obscure as it was not included on the film's soundtrack release. The song resurfaced in 1993 on the Roxy Music/Bryan Ferry compact disc Ultimate Collection. The design of Brundle's telepods was inspired by the engine cylinder of Cronenberg's Ducati Desmo. After filming ended early in 1986, a rough cut of The Fly was shown to Fox executives, who were very impressed. A rough cut was then previewed at Toronto's Uptown Theatre in the spring of that year. Due to a strong audience reaction, the graphic and infamous "monkey-cat" sequence was cut from the film to make it easier for audiences to maintain sympathy for Brundle's character. Another preview screening was subsequently held at the Fox lot in Los Angeles, and this version featured the "butterfly baby" coda. As before, the screening results dictated that the scene be cut. As with most of David Cronenberg's movies, The Fly was tightly edited to maintain a strong pace and to downplay the gore. The final cut runs a brisk 95 minutes, and although very few full scenes were cut, many others were trimmed down. The DVD and Blu-ray editions of the film feature both the shooting script and a great deal of deleted, extended and alternate footage which had never been seen before. Second interview: a short scene that features Veronica Quaife conducting a videotaped interview with Seth Brundle (after his superhuman exercise as seen in the completed film), in which he mistakenly theorizes that being teleported has somehow improved him. A slightly different version of this scene appears in The Fly II, which contains alternate takes and dialogue that does not appear in the workprint version of the scene as presented on the DVD. Additionally, Geena Davis's dialogue is overdubbed by Saffron Henderson, who took over the role of Veronica in the sequel. Monkey-cat: a legendary and infamous sequence in which the desperate Brundle (in a transitional makeup stage which appears only in this scene) uses the Telepods to merge an alley cat and the surviving baboon together in an attempt to find a cure for his condition. However, the resulting "monkey-cat" creature comes out of the receiving Telepod terribly deformed and in unendurable pain. The creature attacks Brundle, who ends up beating the two-headed creature to death with a metal pipe so as to end its misery. The sequence goes on to show the disturbed Brundle scaling the wall of his lab up to the roof, only to feel a sharp pain in his left side (specifically, in the hernia-like bulge seen in the final cut of the film when Brundle first demonstrates his wall-crawling powers). He accidentally slips off the roof, slides down the wall, lands on a metal awning, and watches as a small, fly-like leg emerges from his torso. Horrified by this new appendage, Brundle amputates it with his teeth. Brundle's motivation for fusing the two animals together was intended to be somewhat ambiguous in the context of the sequence, which featured a "test run" for Brundle's fusion "cure" seen at the end of the movie. Thematically, the point of the scene was that Brundle was trying to find some kind of cure for his rapidly deteriorating condition, but was clearly losing his sanity at the same time. The end of the sequence also revealed exactly what the hernia-like bulge on Brundle's torso was, as well as revealing the final fate of the second baboon, story points that are both left unresolved in the final cut. As noted, this sequence was included in the rough cut shown at the Toronto preview screening. The audience had a strong reaction, with at least one person alleged to have vomited. The general consensus from the preview audience was that Brundle was being cruel to the animals (and thus the scene played as being gratuitous, which was not the filmmakers' intent) and, as a result, they lost sympathy for him for the duration of the film. The scene was cut, and remained lost for nearly 20 years. For the 2005 DVD, the scene was restored from the original negative (which was editorially conformed to the workprint version), with tracked-in sound effects and music taken from the completed film. After amputating the insect leg, the script additionally called for Brundle to encounter a homeless woman in the alley, upon whose face he would vomit and subsequently consume. However, this segment was written out of The Fly before filming, even though an actress had already been hired to play the baglady. The scripted sequence appears on the DVD. Butterfly baby; the film's deleted epilogue was shot four different ways (all of which can be seen on the DVD and Blu-Ray releases of the film). In the version of the scene that was originally scripted (and previewed for the Los Angeles test audience), Veronica Quaife is seen in bed with Stathis Borans (having married him) some time after Seth Brundle's death. She awakens from another nightmare in which she gives birth to Brundle's child, and Stathis reassures her that she is safe, and that the baby she is now carrying (having presumably aborted Brundle's) is his. Veronica then falls back to sleep, and she is now dreaming of a beautiful human baby with butterfly wings hatching from a cocoon and flying off towards a distant light source. The epilogue was intended as an upbeat bookend for Veronica's earlier maggot-baby dream, and to give the surviving characters a more hopeful ending. However, the coda did not fare well with the preview audience, since they were too stunned by the film's climax to focus on the coda, which raised a number of questions. Further, due to the dynamics between the characters that evolved during filming, the chemistry between Brundle and Ronnie proved so strong that no one wanted to see her end up with Stathis Borans (which is one reason why the alternate, Borans-less versions of the coda were shot). The filmmakers also agreed that the story should end with Brundle's mercy-killing at Veronica's hands, despite the unanswered questions about Veronica's unborn child that would be raised by the deletion of the epilogue. In one early version of the ending, Veronica is unconscious after Brundlefly throws her into Telepod 1. When the Brundlepod emerges from the prototype Telepod, the raging and mortally wounded creature crawls toward the injured Stathis Borans, who manages to grab a loose wire jutting from the Telepod-human-fly hybrid creature's back and jams it into an electrical socket. The Brundlepod is liquified by the electricity. A later version of the scene is nearly identical, except that the Brundlepod crawls toward Stathis (whether it wants to attack him or is just desperate for help is left ambiguous) and then dies. In the version of the script that appears on the 2005 DVD, Veronica is conscious during the final scene, and when the Brundlepod emerges from the receiving Telepod and crawls toward her, she aims Stathis' shotgun at it, but the creature ends up dying at her feet. Eventually, this was slightly changed to the mercy-killing seen in the completed film. The different stages of Seth Brundle's gradual transformation into "Brundlefly"
The Academy Award-winning makeup was designed and executed by Chris Walas, Inc. over a period of three months. The final "Brundlefly" creature was designed first, and then the various steps needed to carry protagonist Seth Brundle to that final incarnation were designed afterwards. The transformation was intended to be a metaphor for the aging process. To that end, Brundle loses hair, teeth and fingernails, with his skin becoming more and more discolored and lumpy. The intention of the filmmakers was to give Brundle a bruised and cancerous look that gets progressively worse as the character's altered genome slowly asserts itself, with the final Brundlefly hybrid creature literally bursting out of Brundle's hideously-deteriorated human skin. The creature itself was designed to appear horribly asymmetrical and deformed, and not at all a viable or robust organism. Various looks were tested for the makeup effects. Some early test footage can be seen on the 2005 The Fly: Collector's Edition DVD, as well as the Blu-ray release. Stages 1 and 2: subtle, rash-like skin discoloration that leads to facial lesions and sores, with tiny fly hairs dotting Goldblum's face, in addition to the patch of fly hairs growing out of the wound on Brundle's back. Stages 3 and 4-A: piecemeal prosthetics covering Goldblum's face (and later his arms, feet, and torso), wigs with bald spots, and crooked, prosthetic teeth (beginning with stage 4-A). Stage 4-B: deleted from the film, this variant of stage 4 was seen only in the "monkey-cat" scene, and required Goldblum to wear the first of two full-body foam latex suits, as Brundle has stopped wearing clothing, at this point. Stage 7: another puppet which represented the mortally-injured Brundlefly-Telepod fusion creature (initially dubbed the "Brundlebooth" and later the "Brundlething" by the crew) as seen in the film's final moments. The score to The Fly was composed and conducted by Howard Shore, and performed by the London Philharmonic Orchestra. It was released on record, cassette and compact disc (with three additional tracks exclusively included on the latter) by Varèse Sarabande, and in 2005 was remastered and reissued on a two-disc set with Christopher Young's album for The Fly II. Titles in bold are exclusive to the CD release. The Fly was critically acclaimed with most praise going to Goldblum's performance and the special effects. Despite being a gory remake of a classic made by a controversial, non-mainstream director, the film was a commercial success, the biggest of Cronenberg's career, and was the top-grossing film in the United States for two weeks, earning a total domestic gross of $40,456,565. Audiences reacted strongly to the graphic creature effects and the tragic love story, and the film received much attention at the time of its release. If you, or your lover, has AIDS, you watch that film and of course you'll see AIDS in it, but you don't have to have that experience to respond emotionally to the movie and I think that's really its power. This is not to say that AIDS didn't have an incredible impact on everyone and, of course, after a certain point, people were seeing AIDS stories everywhere, so I don't take any offense that people see that in my movie. For me though, there was something about The Fly story that was much more universal: aging and death—something all of us have to deal with. 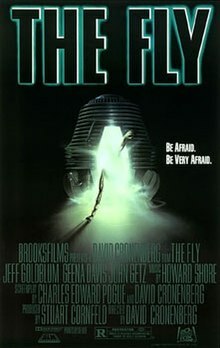 The Fly holds a 92% approval rating on Rotten Tomatoes, based on 59 reviews with an average rating of 8.3/10. The website's critical consensus reads, "David Cronenberg combines his trademark affinity for gore and horror with strongly developed characters, making The Fly a surprisingly affecting tragedy." In 2005, Time magazine film critics Richard Corliss and Richard Schickel included The Fly in their list of the All-TIME 100 Greatest Movies. Time later named it one of the 25 best horror films. The film was ranked #33 on Bravo's 100 Scariest Movie Moments. Similarly, the Chicago Film Critics Association named The Fly the 32nd scariest film ever made. In 2008, the American Film Institute distributed ballots to 1,500 directors, critics and other people associated with the film industry in order to determine the top ten American films in ten different genre categories. Cronenberg's version of The Fly was nominated under the science fiction category, although it did not make the top ten. It was also nominated for AFI's 100 Years... 100 Thrills and AFI's 100 Years...100 Passions and Veronica's warning to Tawny in the film—"Be afraid. Be very afraid. "—was nominated for AFI's 100 Years... 100 Movie Quotes. The quote "Be afraid. Be very afraid." was also used as the film's marketing tagline, and became so ingrained in popular culture (as it—and variants—have appeared in countless films and TV series) that a large number of people who are familiar with the phrase are unaware that it originated in The Fly. The Fly was nominated for the awards in the chart below. Many genre fans and film critics at the time thought that Jeff Goldblum's performance would receive a Best Actor Oscar nomination, but this did not come to pass. Gene Siskel subsequently stated that Goldblum most likely "got stiffed" out of a nomination because the older academy voters generally do not honor horror films. The Fly II (1989) was directed by Chris Walas, the man behind the makeup and creature effects of both films and Gremlins, and is a direct continuation of The Fly. It features Veronica Quaife giving birth to Brundle's mutant son before dying, and focuses on the Bartok company's attempts to get the Telepods working again. David Cronenberg was not involved with the project. The only actor to return for the sequel was John Getz as an embittered Stathis Borans. Veronica Quaife appears briefly in the film, and is played by Saffron Henderson, since Geena Davis declined to reprise the role. 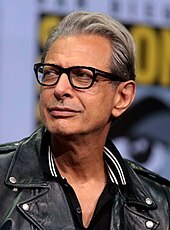 Jeff Goldblum appears in archival footage of Seth Brundle in two scenes, including the post-teleportation interview segment that was deleted from the first film, but put to good use for the sequel. An early treatment for a sequel, written by Tim Lucas, involved Veronica Quaife dealing with the evils of the Bartok company. Brundle's consciousness had somehow survived within the Telepod computer, and the Bartok scientists had enslaved him and were using him to develop the system for cloning purposes. Brundle becomes able to communicate with Veronica through the computer, and he eventually takes control of the Bartok complex's security systems to gruesomely attack the villains. Eventually, Veronica frees Brundle by conspiring with him to reintegrate a non-contaminated version of his original body. Cronenberg endorsed this concept at the time. Geena Davis was open to doing a sequel (and only pulled out of The Fly II because her character was to be killed in the opening scene), while Goldblum was not (although he was okay with a cameo), and this treatment reflects that. However, a later treatment written by Jim and Ken Wheat was used as the basis for the final script, written by Frank Darabont. Mick Garris also wrote a treatment, with elements incorporated into the final film. Beginning in March 2015 IDW Publishing released a five-issue comic book miniseries titled The Fly: Outbreak, written by Brandon Seifert. The story is a direct sequel to the events of The Fly II, and features Seth Brundle's son, Martin, inadvertently causing a transgenic outbreak while attempting to cure Anton Bartok, to whom he'd previously transferred his mutant genes at the end of The Fly II. In the 1990s, Geena Davis was reportedly involved with an alternate sequel to The Fly, to be directed by her then-husband, Renny Harlin, titled Flies. The script by Richard Jefferies was said to feature a story where Veronica gives birth to twin boys, and herself survives the ordeal. In 2003, it was announced that a second remake of The Fly was being developed, to be directed by Todd Lincoln, produced by Fox Searchlight Pictures, and released in 2006, but this did not happen. I have written a script that is more of a strange lateral, let's say oblique sequel than it is a true sequel, and it's certainly not a remake of the original. It's financed by Fox, and whether it will get made or not, I cannot say at the moment because there are a lot of up-in-the-air factors that deal with internal studio politics and a bunch of other things that I'm not in control of. But I would make it if they greenlight it, let's put it that way. Well, I did talk to Fox, because my agent found out that they were approaching people to do a remake of my film. He sort of said, "Well, you know, what about David?" And they said, "Well, we never thought of that!" I think they'd been to Guillermo del Toro and Michael Bay. I said, "Long ago I proposed a sequel to Mel Brooks when he said he wanted to make a sequel." He didn't like what I proposed because he said it wasn't the same as the original movie. "A sequel," he said, "should be more of the same." And I said, "Well, Mel, then I'm not interested." And he went off and did his sequels [sic] and they had nothing to do with me and they weren't very successful. But I still had this idea in mind—which no, I won't tell you—and I said to Fox, "I'll write that idea up because, as I think of it, it could be interesting." And they were excited about it enough to pay me to write a script. And then for various reasons it kind of got bogged down. I don't know exactly why. It seems now that it's not going to happen. But it's a script that I like and would do. It's not exactly a sequel, and it's certainly not a remake. More a meditation [...] it involves teleportation. Budget constraints and other things. I think maybe the script that I wrote was a little too radical for Fox, and they felt it really needed to be a very low-budget film at that point. However, what was in it that attracted them could not be done low-budget. So I think that was the problem. He also described the project as "more of a sequel or a sidebar. It was a meditation on fly-ness. None of the same characters or anything and, of course, with an understanding of modern technology." Despite Cronenberg's prior assertions that he does not make sequels to his films, he returned to The Fly for the opera The Fly in 2008, and his proposed sequel film project would mark a second return to the material, as well as his first sequel to one of his previous movies. However, the film is not moving forward. A 6-inch figure of "Brundlefly" was created by McFarlane Toys for their Movie Maniacs line in 2000. Also, a 15-inch polystone statue of "Brundlefly" was made by Sideshow Collectibles in 2008. ^ "The Fly". American Film Institute. Retrieved 2016-07-04. ^ a b c Thurman, Trace (2016-09-15). "'The Fly' Was Released 30 Years Ago Today". Bloody Disgusting. Retrieved 2017-10-04. ^ a b c d e Westwood, Emma (2016-08-15). "The Fly: A 30-Year Love Story". 4:3. Retrieved 2017-10-04. ^ "FILM FREAK CENTRAL takes a look at David Cronenberg's body of work—with a little help from the master himself". Film Freak Central. Archived from the original on 2003-04-01. ^ Jeffrey T. Iverson (September 4, 2008). "David Cronenberg Tries Opera". Time. ^ "Gene Siskel's 10 Best Lists: 1969 to 1998". Caltech.edu. Retrieved July 2, 2010. ^ "The Fly (1986)". Rotten Tomatoes. Fandango Media. Retrieved July 17, 2018. ^ "Time Magazine's All-Time 100 Greatest Movies". Time. February 12, 2005. Retrieved July 2, 2010. ^ "Top 25 Horror Movies". Time. October 29, 2007. ^ "Chicago Critics' Scariest Films". AltFilmGuide.com. Retrieved July 2, 2010. ^ "AFI's 10 Top 10: Official Ballot" (PDF). AFI.com. Retrieved July 2, 2010. ^ "AFI's 100 Years... 100 Thrills: Official Ballot" (PDF). AFI.com. Retrieved July 2, 2010. ^ "AFI's 100 Years...100 Passions: Official Ballot" (PDF). Retrieved 2012-11-01. ^ "AFI's 100 Years... 100 Quotes: Official Ballot" (PDF). AFI.com. Retrieved July 2, 2010. ^ Mathews, Jack (August 27, 1986). "Goldblum's 'Fly' May Land In Oscar Circle". Los Angeles Times. ^ "Oscar Swats 'The Fly'". Chicago Tribune. February 18, 1987. ^ Orange, Alan (December 17, 2014). "David Cronenberg's 'The Fly' Gets a Comic Book Sequel". MovieWeb. Retrieved December 18, 2014. ^ "Another "The Fly" Remake In The Works". Horror.com. Retrieved 2012-11-01. ^ "What The Fly Remake Could Have Been Like..." Insomniac Mania. 2006-03-28. Retrieved 2012-11-01. ^ "David Cronenberg Remaking The Fly... Again?". Shock Till You Drop. 2009-09-23. Retrieved 2012-11-01. ^ "The Big Interview - Empire". Readperiodicals.com. Archived from the original on 2013-02-01. Retrieved 2012-11-01. ^ "David Cronenberg interview: 'Cosmopolis', 'Nightbreed', 'The Fly' sequel". Digital Spy. 2012-09-13. ^ "David Cronenberg Shares Details Of Canceled 'Eastern Promises 2' & 'The Fly' Remake +". Indiewire. 2012-12-14. ^ Ed (2011-10-03). "Exclusive: Cronenberg Has Written a Sequel to The Fly". Shock Till You Drop. Retrieved 2012-11-01. ^ Rich, Katey. "David Cronenberg Reveals Details On The Scrapped The Fly Remake, Eastern Promises 2". Cinema Blend.